Monkfish Book Publishing, 9780979882876, 465pp. After playing an intimate role in the mystery of the Resurrection, what is left for Maeve, the Celtic Mary Magdalen? Never a follower, will she emerge as a leader of the early church? Will she retire quietly to mother a sacred bloodline? Will she set sail for France to proselytize and go spelunking? The answer: all and none of the above. No sooner does Maeve open her mouth to preach the gospel her way than a fierce debate begins about what to do with the child she is carrying. Maeve has her own ideas about where best to raise the savior's scion. When she returns to Temple Magdalen, the holy whorehouse she founded, a custody battle of biblical proportions ensues. Maeve, her infant daughter Sara, and Jesus' mother flee to the remote Taurus Mountains where they live in hiding among the Galatians until a mysterious man is dumped on their doorstep more dead than alive. When Maeve discovers the identity of the man she has healed, she is appalled and determined to keep her family's secret. But Maeve has reckoned without the will of her brilliant, angry adolescent daughter who resolves to find out the truth about her father--for herself. 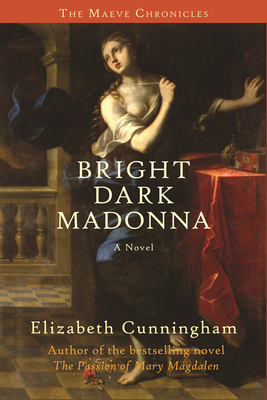 Required reading for fans and accesible to those new to The Maeve Chronicles, Bright Dark Madonna takes the reader on a breathtaking journey from the temple porticoes of Jerusalem, to the Temple of Artemis in Ephesus, to the south of France, and, as always, to the treacherous, beautiful terrain of the human heart. Best know for her pagan novels, The Return of the Goddess and The Wild Mother, (Station Hill), Elizabeth Cunningham is the direct descendant of nine generations of Episcopal priests. She was ordained as an interfaith minister in the Cathedral of St. John the Divine. She balances writing with a counseling practice.